We continue with more Illumination. This entry was posted in Puzzles and tagged hard, illumination on 2016-09-28 by rob. Here’s a team round I made for the Polish championships earlier this year. It was used for a casual team competition in the evening, between puzzle and sudoku championships. It’s a two stage puzzle. 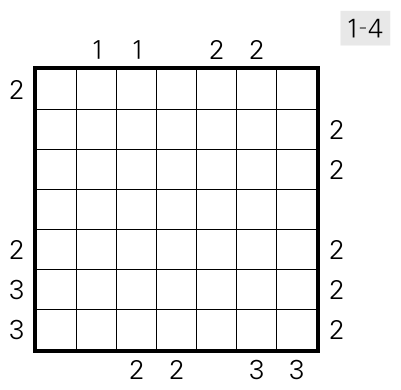 The first part consists of dissecting some grids to form a set of pentominoes, which are then used as the pentomino set for a big Statue Park puzzle. 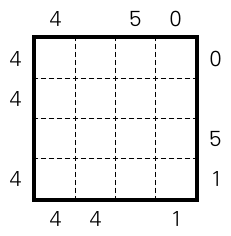 The puzzles are designed to be solved with a pair of scissors (i.e., cut up the dissection grids, then place the resulting pentominoes on the statue park grid). If you want to avoid that, you should be able to get a similar solving experience by only marking full pentominoes, and not marking empty cells for the Statue Park. We went with teams of three in Poland, which is probably the best size for this. This entry was posted in Puzzles and tagged pentomino dissection, statue park, team round on 2016-09-21 by rob. This entry was posted in Puzzles and tagged illumination, medium on 2016-09-16 by rob. This entry was posted in Puzzles and tagged illumination, medium on 2016-09-15 by rob. Here’s something new, though I wouldn’t be entirely surprised if someone did this before. There’s an example below. Edit The example was buggy, should be fixed now. Rules Place some light sources and walls. 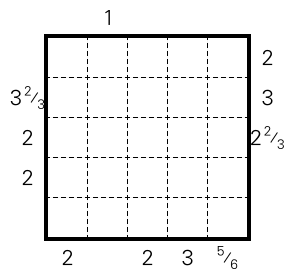 Light sources go on grid vertices, but not on the border. Walls go on grid lines and must not touch light sources. 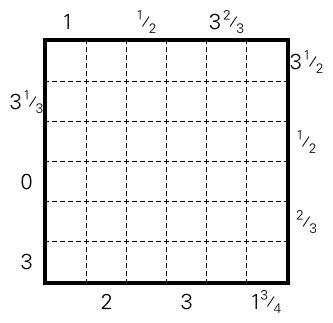 Numbers outside the grid indicate how many light bulbs illuminate the adjacent edge in total, where a light bulb that illuminates the entire edge counts for 1 (regardless of distance), a light bulb that illuminates the edge partially counts for the corresponding fraction. This entry was posted in Puzzles and tagged easy, illumination on 2016-09-14 by rob. Here’s another skyscrapers puzzle, this one with rather many parks. They feel quite different. This entry was posted in Puzzles and tagged medium, skyscrapers on 2016-09-06 by rob.